Använd vredet på sidan för att ställa rätt svetstid för olika typer av påsar. Tryck ned handtaget och vänta på att maskinen piper. Svetsbredden är 2mm som standard. PC modellerna har en kniv som gör att du kan enkelt skära av överflödigt material med ett handtag. Maskinen är utrustad med en säkerhetsfunktion som gör att den stängs ner om det gått mer än 3 sek i en svetscykel. Use the heating-time adjuster knob facing you to set the appropriate heating time for the bag. two variations in the length: 200mm (P-200, PC-200) or 300mm (P-300, PC-300). 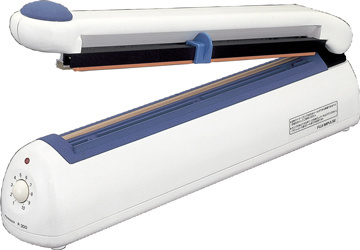 The sealer comes equipped with a 2mm heating element when it is shipped from the factory. The 2mm heating element may be replaced with a fusion-cut heating element as needed to create fusion-cut seals. space and is very mobile. The resin body, featuring arounded design, suits well at a showcase without disrupting the aesthetics of the shop. Pastries and confectioneries (bread and other baked goods, candies, etc. ), pasta and noodles, medicine, office supplies, books, magazines, vegetables, sundry products, metal products, parts, food products, etc. is completed to cut off any excess material from the end of the bag. 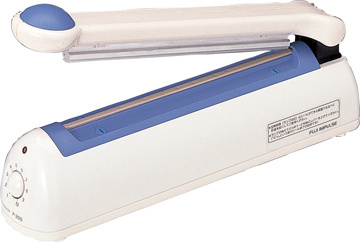 This cutter feature can be used to create multiple bags from tube-shaped film. As a safety measure, the unit is equipped with a device to shut off the circuit in about 3 seconds in case of abnormal heating (continuous current) caused by timer malfunction.